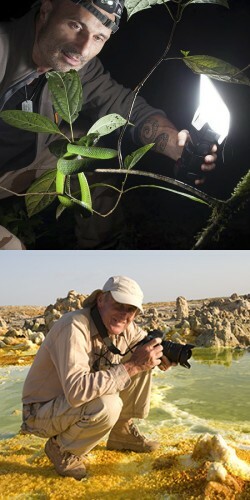 We’re both coming from Normandy and we have been doing animal and nature photography for dozens of years. We met each other on the field, at the estuary of the Seine, and we would soon professionally collaborate. We also realized movies together about birds in Normandy that has been awarded in specialized festival such as the Menigoute or the Bird Festival. We are skillful in a lot of different fields and we even design some of our shadow devices for high speed shoots with flashlight. Our huge passion for nature magnificence led us to travel around the world looking after unusual landscapes or surprising animals such as bats or reptiles. We both individually won the Grand Prix and the Special Prize at the International Contest of the Animal Photography in Montier en Der, in 1997 and other prizes afterward. Since, we’ve postponed from contests and festivals but our passion for nature and photography remains the same. Through pictures we manage to get involved in environmental causes such as a large-scale educational exhibition with Yann Arthus Bertrand on biodiversity and sustainable development. Our pictures have been distributed by the Bios Agency since 1995.